This might be the drop that made the spindle famous, the 4/6 C1500 kit. Using the spindle with drop coil springs to put together a 4″ front drop has been done countless times, probably more times than any other lowering technique! The only bug-a-boo is occasional wheel interference issues. Go grab any Truckin’ or Streetrucks magazine and you guaranteed a 4/6 install kit on a 88-98 C1500! CALMAX SuperShocks are the best choice for your project. 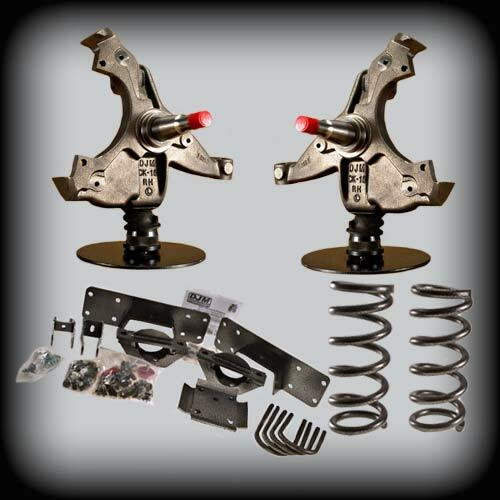 Here you can choose the correct front shock to work with these DJM parts. The 4 inch front drop means you need a shorter shock. Calmax Supershock part number 1315 is the perfect choice! In case your wondering why 2 different shock part numbers in the rear? Your factory shock mounts are staggered, one in front and one behind the rear axle, since your going to the trouble to lower why not have the optimum length shock for each side! Calmax Supershock number 2000 is for the drivers side. In case your wondering why 2 different shock part numbers in the rear? Your factory shock mounts are staggered, one in front and one behind the rear axle, since your going to the trouble to lower why not have the optimum length shock for each side! Calmax Supershock number 2200 is for the passenger side. This is where it all began, the classic drop spindle. One could say the entire modern lowering culture sprang from this part! Be aware this spindle is for a 88-91 Standard Cab Only!! I want to drop my 1500 without any problems, like wheels or alignment, oh yea, a factory ride.